Xiaomi is not a new name for the Indian and International smartphone market now. It has proved to be a very dependable and successful OEM in last 2 years. They started with a totally different approach and marketing methods to grab more and more consumers and sell their devices. We appreciate the fact that the company is trying to bring a change in the monotonous nature of the market, which actually benefits both the company and the consumers. Xiaomi has rolled out 2 new devices this year and it was looking very promising until we spotted a new scam. 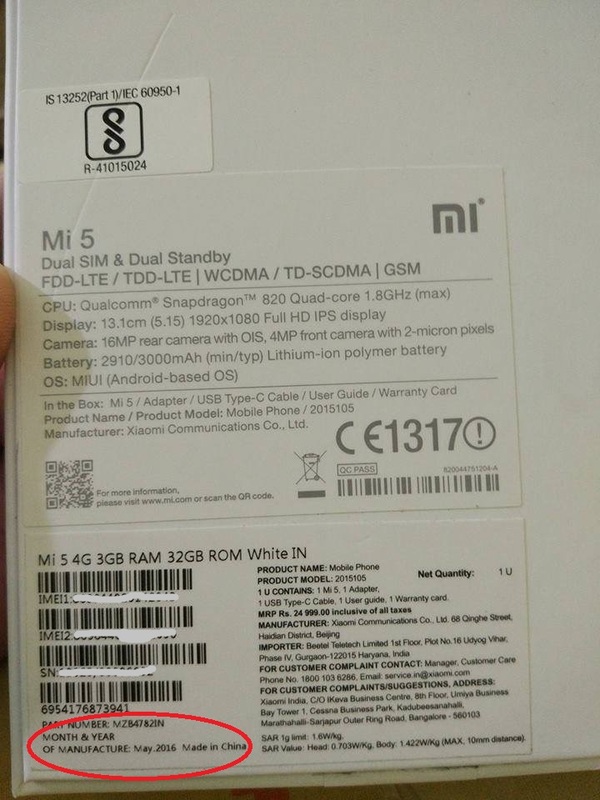 Redmi Note 3 and Mi 5 are going out on sale today, but this incident may change your views for the company. A customer booked his Xiaomi Mi 5 during the flash sale and was excitedly waiting for his phone to arrive like any of us. When he finally received his handset, he took a view over the box and what he saw was unbelievable. The manufacturing date on the box was printed as of May 2016, and if I remind you, you are reading this post on 27th of April 2016. How can a company of this size and structure do such a mistake? Or is it done deliberately? Is it something that Xiaomi has been doing since a long time and didn’t get noticed? Is Xiaomi going too far for profit making? Is it easy for you to trust on brands like Xiaomi now? These are some questions that every disappointed consumer would be asking, and we are also waiting for the company to explain this incident. How does this benefit to the company? It is very beneficial to the company until they get caught like this case. It is very simple to understand why companies do this. When we buy a product, we usually prefer the freshest item because it would be more new and better than those who are manufactured earlier. Putting a date of 2 months after the manufacturing will directly cut off the two extra months from the phone’s age and the buyer who buys it 4 months after the printed (fake) manufacturing date would be fooled with a six month old phone, thinking it is just 4 months old. Let’s see what Xiaomi has to say about this case, but all we know is that this incident will surely affect a lot of consumers in India. We suggest our readers to always check the product details before buying any product from any company.